Last Thursday saw nearly a dozen Wallach Place neighbors (and one from as far away as V Street), gather at the DC Historic Preservation Review Board monthly meeting. On the afternoon docket was discussion and a vote on the Level 2/Eric Colbert 1905-1917 14th Street project, a 7+ story, 160 unit apartment building that’s proposed for the corner of 14th and Wallach. Despite the design team’s statements that they ran all the official notification and process traps, the first we’d heard of the project was in a May 16 City Paper story. Needless to say many were caught off guard, but a sizable group of residents from the surrounding area scrambled to get up to speed on it following a presentation the design team made at the June 1 USNA meeting. Team Wallach has been through this fire drill once before with JBG’s proposed 10 story, 250 room ’boutique hotel’ around the corner at 13th and U – a different development, yet the same concerns: massing, scale, height, parking, traffic, trash and process. Hardly NIMBYs, the residents welcome development on both sites – meaningful projects that would rid the immediate neighborhood of two eyesore, non-contributing bunkers. Adding to our interest is the fact that two award-winning architects have signed onto the projects. Like we did with JBG and architect David Schwarz, we invited Level 2’s David Franco and Colbert to a block meeting to share our concerns and hopes. It was a cordial meeting; Franco and Colbert were both generous with their time and receptive to our thoughts. Then it was up to HPRB to weigh in. Weigh in they did. Joseph Taylor, AIA, said the project is “a long way from being done… too much height (on Wallach)… some restudy is required for compatibility.” Taylor had concerns about the project’s windows [Ed. note: What we have here is a failure to fenestrate]. 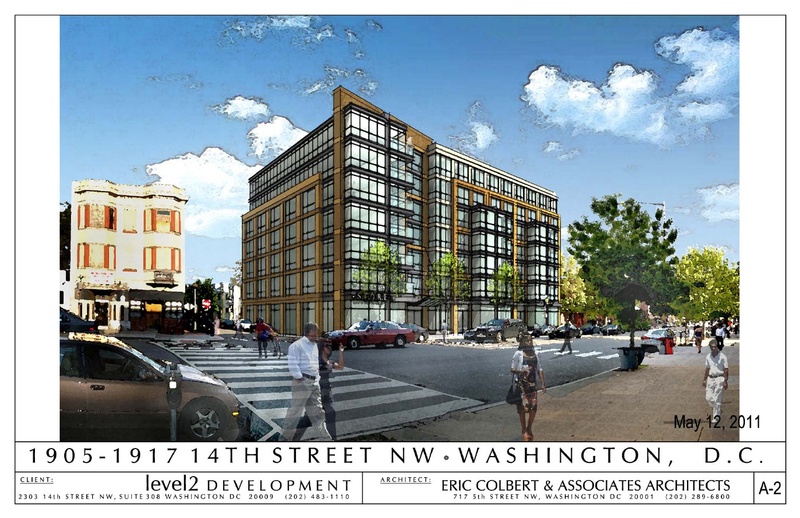 He said the building would look more at home on K Street than 14th. Chris Landis, AIA, was brief in his remarks telling Franco and Colbert to, “Reset and come back…” Landis said that not everyone was going to be “totally happy,” telling the Wallach residents that what ultimately goes up, “won’t be a 3 story building.” [Disclosure: Chris Landis and his brother Ethan’s firm renovated our townhouse in 2001]. Catherine Buell, shared concerns with her colleagues and wanted to see the Wallach Place elevation clipped and something “more creative.” She admitted Colbert has a “tough job (ahead with) design problems.” Buell motioned to recommend against approval in concept (Boasberg seconded). The motion carried unanimously on a voice vote. She asked the design team to bring in examples of other buildings in the area, restudy the 6th and 7th floors, the Wallach Place elevation and setbacks. The beautiful building on that site was razed in 1970 and the riot-proof pillbox that took its placein 1988 can’t go away soon enough. We’re willing to help with demo. Gladly. It would be a good idea for some of us, as well, to document the buildings on 14th between P and W. Also, we should ask the board to ask Level II to present their building in proper scale so we can really see the impact on the existing buildings. T he current drawings make the building just slightly taller than the ones next to that are much shorter. Finally, I think we should reach out to Level II and assure then that we want a building there, we just want a really great building since we will be living with it for decades. What I’ve heard from many of the Wallach residents is that they want a two to three level building max on that site. This is a becoming a big concern now that residents opposed to density are dragging down development of one of the city’s major commercial and transit rich corridors. Is this really about the design or just about not wanting more people living in this neighborhood? That’s not the case from the Wallach resident’s we’ve spoken with. 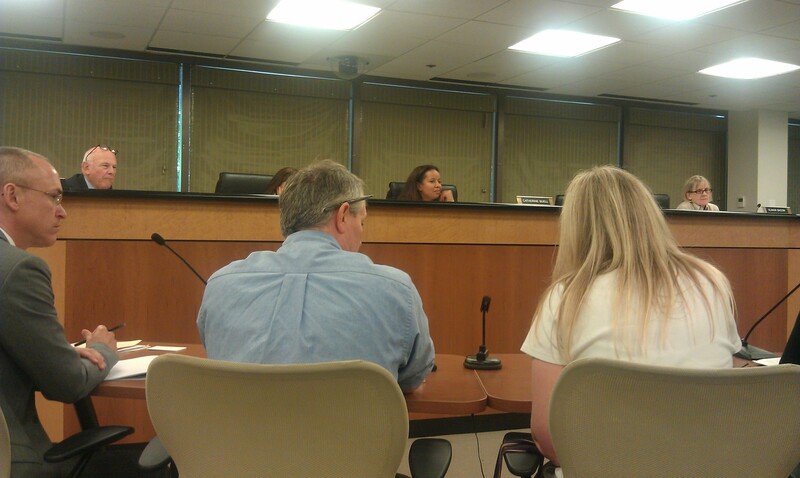 We’re realistic and took Board member Chris Landis at his word that there will be more than three stories built there. We live cheek by jowl in 16 foot-wide townhouses, how can we be opposed to density? Many of us moved into that neighborhood when you couldn’t pay people to live there and we waited years for the first signs of development to blossom. And to underscore what we said in the post, the concerns we raised at the hearing had little to do with Colbert’s design and more with the actual physical characteristics of the project: mass, scale, and height. The Board agreed uinanimously. Definitely not the case that most people want a 2/3 story building. I think we are realistic but we prefer that it not be 93 feet and that it be in scale with the retail already renovated on the Eastern Side of 14th between Wallach and to play better with the houses on Wallach. We argued that the board should consider each building in it’s proposed site. 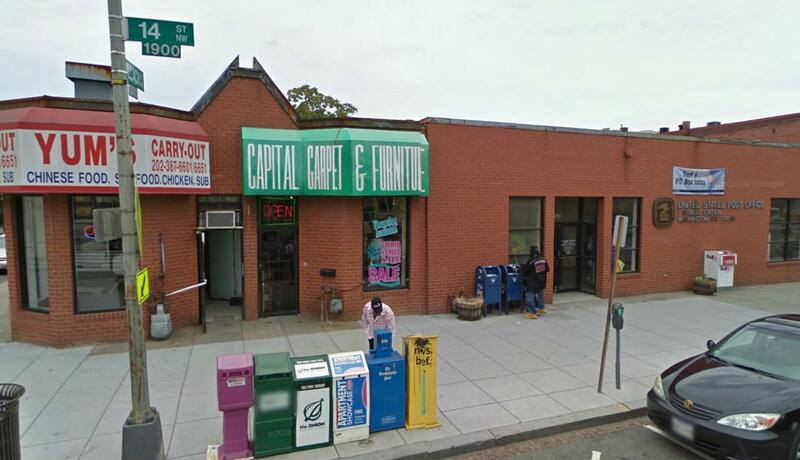 Wallach is small, short, narrow and intimate and that the near existing retail neighbors on 14th between WP and S exhibit an architectural rhythm and fabric that should not be overwhelmed.. We all hate the existing Yums building. we all hate the existing yums building but don’t want anything more than 3 stories. that keeps property values high and people out. Nice try Mike and Steve, but wide of the mark and wholly untrue. Please introduce yourselves to us at the next HPRB meeting. I live on the block and I have talked with many of my neighbors and I have not heard a single person tell me that they will only accept a shorter than 3 story building. Everyone I know is very reasonable about this and no one wants it to be hard for others to move in. Those of us who have lived here for decades (!) especially feel that way. But people want commercial development to be designed so that its height and mass fits the scale of the street. It IS a historic district. But people want commercial development to be designed so that its height and mass fits the scale of the street. So, not the current proposal, but not 2-3 stories either? What are you for, exactly? I could make some tweaking of the existing proposal in terms of design, but I think the height and mass and density are entirely appropriate for a building that fronts on 14th Street.